Do you have a mixed-breed dog and wonder what breeds make him who he is? Or perhaps you want to know what hereditary diseases or health conditions he could develop in the future. For those of us who own mixed breeds, your dog’s genealogy is a huge life mystery! Fortunately, dog DNA tests can solve some of these mysteries for you. Keep reading to find out how dog DNA tests work, what you can discover about your pup and other information. What Are Dog DNA Tests? What’s The Best Dog DNA Test? An at-home dog DNA test consists of a simple cheek swab that you receive in the mail. You swab the inside of your dog’s cheek, send in the swab, and the lab tests your dog’s DNA. It’s a painless procedure for you and your pup, and it can tell you a lot about where your dog came from (and in some cases give you information if your dog is genetically prone to certain health conditions). How much does a dog DNA test cost? With at-home dog DNA tests, you get what you pay for. The best and most accurate test will run you approximately $170, but there are less expensive (and less reliable) tests available for $70-$85. What Can You Learn From Dog DNA Testing? Not all dog DNA tests are the same. All dog DNA tests look for breed types and your dog’s ancestry, but some offer testing for the genetic predisposition of certain hereditary diseases and health conditions. Dog breed tests give you a percentage breakdown of your dog’s breed ancestry, i.e. 50% Labrador Retriever, 25% Cocker Spaniel, etc. The accuracy of these DNA breed tests relies on each company’s existing database of breeds. Some companies have a larger database than others — an important factor in the accuracy of your dog’s DNA test results. Video: How Does a Dog DNA Test Work? Check out the video to learn more about how dog DNA tests work. How Do Dog DNA Tests Differ From Human DNA Tests? DNA testing for dogs doesn’t differ much from human DNA tests. Of course, we’re talking about the testing process, rather than the DNA itself. Like humans, each dog has its unique DNA fingerprint. Unlike humans, purebred dogs and breed mixes have evolved more quickly over the years. The basic science behind the DNA testing, however, is very similar. Both dog and human at-home DNA tests use a simple cheek swab. Once the sample goes to the lab, scientists run similar types of DNA tests looking for known genetic markers, based on each species. Check out our Best Human DNA Ancestry Test article to learn more about at-home human DNA tests and what you can learn about your family’s roots. If you’ve ever wondered what breeds make up your canine companion, a dog DNA test is a fun way to solve your pup’s mystery. 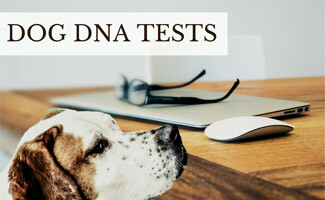 See our Dog DNA Tests Reviews on our sister site for more information and our recommendations for the best at-home dog DNA tests on the market. They make unique gifts for the dog lovers in your life! What answers are you looking for by giving your dog a DNA test? When I adopted my dog, the rescue organization said that she was a lab-great dane mix but when I tested her with the Embark DNA test, it said she is indeed part lab but she is not great dane at all but she is also part mastiff, which is also a huge dog. Beyond that, they also said she was part beagle and part greyhound. I would never have guessed all these dog breeds were in my sweet Daisy girl!